Bitte kontaktieren Sie uns, wenn Sie weitere Informationen auf Deutsch benötigen. While people are growing increasingly aware of environmental challenges and the importance of preserving energy, there’s still plenty of work to be done. 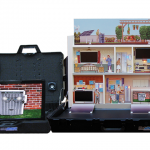 The Smart House energy conservation simulator is a fun, engaging presentation tool designed to help your audience turn their energy-intensive bad habits into more eco-friendly behavior. Hidden monitors are unveiled throughout the Smart House, each introducing animated characters that use humor to convey energy conservation facts and tips. Using LED lights, flip illustrations, moveable 2D figures and video support material, guide your audience through an “inefficient” home and show how it can become smarter. Topics covered include insulation, heating and cooling, windows, appliances, lighting, water, meter, phantom power reduction and more. 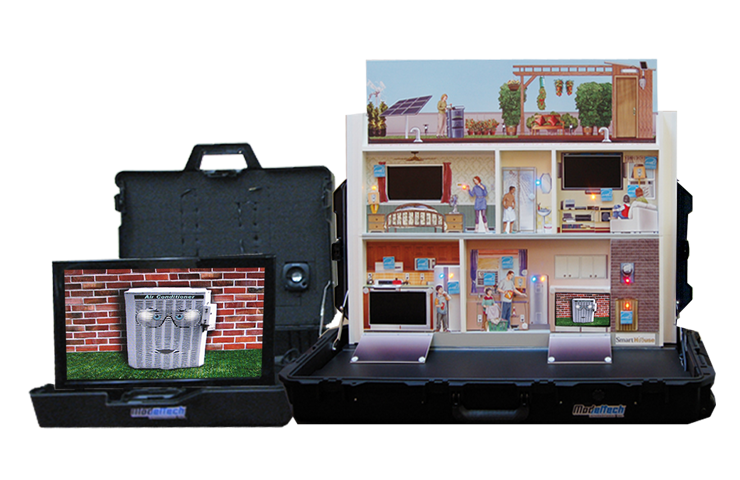 Weighing less than 30 lbs (13.5 kg), the Smart House energy conservation simulator fits into a handy carrying case. When you’re done, simply pack up and move on to your next destination! Portable, compact and light: less than 30 lbs (13.5 kg)!